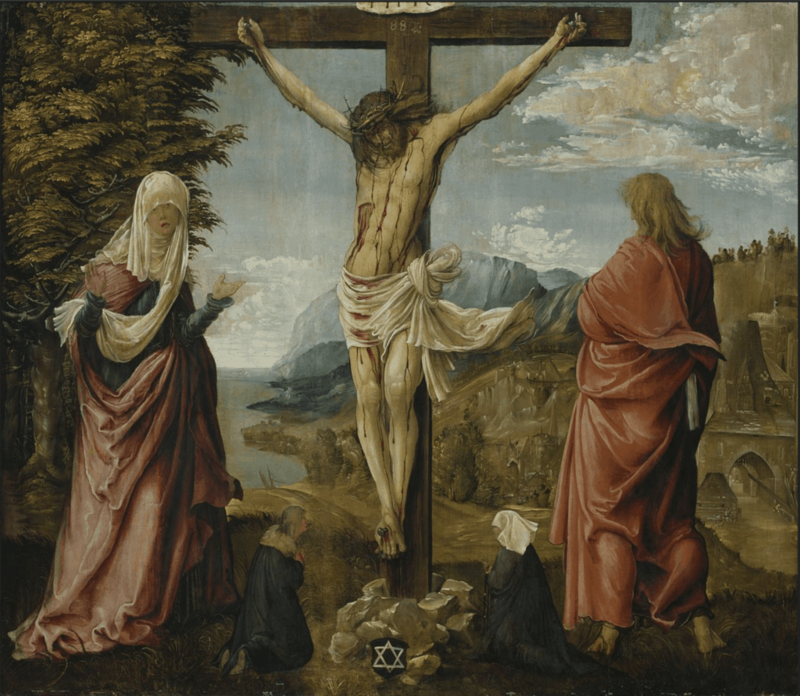 The Painting: (1) Notice how enormous the crucified Jesus has become, such that the normal-sized people who kneel there at the foot of the Cross are tiny by contrast. Jesus’ foot is about one-quarter the height of those two! Why is it, we wonder, that the very event meant to diminish Jesus by humiliation and violence appears to have made Him a massive, imposing Presence towering over the world below? (2) Notice also that the two people closest, dearest to Jesus – his own mother and the “beloved” disciple – have by contrast with those two kneeling figures become enormous too. We consider that the closer we are drawn to Jesus, and especially to Jesus on the Cross, the more massive, the more substantial, we become as persons. To be “near” Jesus means being distant from “smallness” of heart, of intellect, and of vision. (3) Yet actually to be “big” in God’s estimation does not include (!) feeling “big” or “substantial” or “consequential”. (Dare ask Jesus there, or his mother, or John how they are feeling!) Instead, one feels not “big” but small, emptied out by suffering of all that is not the love we feel for those whom we love and who love us back. When we have been stripped of everything else and left with nothing but the love we have for particular persons, and for Divine Persons, we are made “big”, big enough to stand as “tall” as Jesus. Jesus might have expected that at the end of things – and He was well aware of what His ending among us humans would be – He would die alone. Early on in His public life He recognized that His own family was growingly alienated from Him (the decision to move from Nazareth to Capernaum is one of several indications found in the Gospel accounts). At some point, His own family ceased to make an effort to understand the “difference” that He was, which compelled and shaped His life in a deeply challenging way. Further, he often and early felt the alienation, and eventually the outright hostility, coming from religious leaders, who expected Him to submit to them instead of to the mission that He Himself was. Further, He knew, as did any Jew, to expect only the disdain of, not help from, the State – the Roman Empire, and its lieutenants, operating in the land. Finally, He foresaw that all of His disciples would abandon Him (though the steadiness and faithfulness of His women followers seemed to have defeated His expectation). Indeed, He must have guessed early on that He would die alone. In the Passion accounts of Matthew, Mark, and Luke, His expectation was proven right. Though Jesus walked among large crowds on His way to the Place of the Skull, and though Jesus was raised up on the Cross during the time when Jerusalem and all surrounding towns and roads were choked with out-of-town Jews coming for Passover, these crowds were not with Him but hostile (or simply indifferent) towards Him. And some women disciples, and His mother, and John, stayed with Him … but “at a distance”. In the accounts of Matthew, Mark, and Luke, Jesus died alone … in a crowd. But then there is the account of the Crucifixion in John’s Gospel, which our Painting (above) illuminates. Suddenly, instead of the noise of jeering and mocking remembered and emphasized by the other Evangelists, John remembers instead an encompassing stillness there. Our painter captures the particular moment, very soon indeed before Jesus died, when John and Jesus’ mother walked up very close to Jesus – not “at a distance” – and shared a profoundly intimate final moment together … the three of them. See how the painter “shrinks” the significance of “the others at Golgotha” by making them physically, by contrast, tiny? See how he sets this scene in a wilderness setting and with a beautiful view to contemplate? Peacefulness. Stillness. The natural world had not forgotten by Whom it came to be and through Whom it was sustained. The “stillness” saturating this moment that John and Mary and Jesus shared has an analogy to that of a mother, who while fully engaged in the midst of a party that she is hosting, can still hear her baby crying out upstairs. (How in the world can she hear like that?) For those three together, at the last, their love “scrubs” clean the disordering presence of everyone else at Golgotha, erasing all of their noise and intrusions. Now, finally, it is only the three of them moving as the Trinity moves: effortlessly, majestically, enfolded in the gravitational power of love that is completely unshielded. They hear only each other. We must enter that stillness with them, or we will be unable to hear what they are saying … and to be taught to understand. These three were up to something so transcendently different than what the Roman soldiers reported to their wives that they had done that Friday afternoon, following orders, when they put three men deserving death up on their crosses of humiliation. but it is really release into union. Here, right here, was the victory of God luminous! Evil’s sole purpose in this world is to corrode and to wreck and to end all friendship, turning relationships into complex manipulations of others. Evil is a toxin released into the world corroding the “connection” at the center of real relationship, wanting us each to feel, and then to conclude, that we are all … alone. But here, right here, in that most unlikely place – at Golgotha – that toxic agenda suffers a catastrophic defeat; it is mocked. In the end, here, in profoundest stillness, words of love and of friendship are movingly expressed and eternally remembered. This, and these “last words” in particular, are proof of the victory of God. So, I was taught that love is our Lord’s meaning. And I saw very certainly in this and in everything that before God made us, God loved us, which love was never abated and never will be. And in this love, God has done all his works, and in this love, our Lord has made all things profitable to us, and in this love our life is everlasting. In our creation we had beginning, but the love in which God created us was in him from without beginning. In this love we have our beginning, and all this shall we see in God without end. Doers of the Word: Any act of genuine friendship is the most powerful defiance of all that is dark, damaging, and corrosive in our American society and its institutions. Evil wants such damage and makes it happen, because evil desires each person to feel all alone, to be convinced that no one really and honestly cares. Make this third week of Lent your week of “random acts of friendship”, or better, not random but skillfully deliberate acts of friendship exercised towards your friends. Follow the example of Mary and John and Jesus there at the Cross: the victory of God in their heartfelt expressions of friendship. * It is not clear whether four women are meant, or three (i.e., Mary the wife of Cl[e]opas [cf. Lk 24:18] is in apposition with his mother’s sister) or two (his mother and his mother’s sister, i.e., Mary of Cl[e]opas and Mary of Magdala). Only John mentions the mother of Jesus here. The synoptics have a group of women looking on from a distance at the cross (Mk 15:40). m Mt 27:55; Mk 15:40–41; Lk 8:2; 23:49. * This scene has been interpreted literally, of Jesus’ concern for his mother; and symbolically, e.g., in the light of the Cana story in Jn 2 (the presence of the mother of Jesus, the address woman, and the mention of the hour) and of the upper room in Jn 13 (the presence of the beloved disciple; the hour). Now that the hour has come (Jn 19:28), Mary (a symbol of the church?) is given a role as the mother of Christians (personified by the beloved disciple); or, as a representative of those seeking salvation, she is supported by the disciple who interprets Jesus’ revelation; or Jewish and Gentile Christianity (or Israel and the Christian community) are reconciled. New American Bible, Revised Edition. (Washington, DC: The United States Conference of Catholic Bishops, 2011), Jn 19:25–27. John the Evangelist loves to use the word “abide” to mean a steady-state closeness that God is with us, and by His grace, of us with Him. It might seem less “divine” to love only particular persons, rather than loving everyone as we “know” that God does. (However, let us not forget that God chose to love a particular people, making of them a nation.) But it is my conviction that to love “equally” everyone (the term that St. Catherine of Siena uses to describe the kind of love that Christians aspire to) can only happen when we have learned to love particular persons in an ordered, profound, and mutual way. Consider the remark by the incomparable G.K. Chesterton in Generally Speaking (London: Methuen & Co., 1930), p. 86 – writing this in critique of the failed ending of Barrie’s story Peter Pan: “He [Barrie concerning his Peter Pan] might have said that he was a god, that he loved all but could not live for any; that he belonged not to them but to multitudes of unborn children. Or he might have chosen love, with the inevitable result of love, which is incarnation; and the inevitable result of incarnation, which is crucifixion; yes, if it were only crucifixion by becoming a clerk in a bank and growing old. But it was the fork in the road; and even in fairyland you cannot walk down two roads at once.” My emphasis. I am grateful to Joseph Pearce, in his book Further Up and Further In (2018), who references this quotation from Chesterton. Mark 3:20-21 indicates that Jesus’ own family, and very early into His public ministry (thus we can understand why his mother and family needed to learn to get used to this extraordinary son or “brother” or cousin, etc.) was concerned enough about what people were saying about Jesus – they were saying that He was “out of his mind” – that they set out to go get him and to bring Him back home to Nazareth to see if they could help straighten Him out. The enduringly “strange” nature of the so-called “triumphal entry” of Jesus into Jerusalem, which suggests to us that at least for a moment a compellingly large throng of people were indeed for and with Jesus, is a puzzle beyond solving. If that “triumphal entry” was what it apparently was, then why or how could that throng have so quickly “forgotten” all of that and joined in the chorus of a different kind of throng shouting: “Crucify Him!”? The two people crouching around the foot of the Cross are a symbolic stand-in, I believe, for “everyone else” who was at Golgotha that Friday afternoon. “Relationship” is a gift of the divine Trinity to us, to all of us, and through every part of the natural world. “Relationship” is of the Light. Th evil spirit operating in the world cannot do relationship; it can only “imitate” relationship in acts of manipulation of, control of, people. Manipulating others to serve one’s ends is nothing at all the same as building and sustaining genuine relationships with others. Julian of Norwich, Julian of Norwich: Showings, ed. Richard J. Payne, trans. Edmund Colledge and James Walsh, The Classics of Western Spirituality (Mahwah, NJ: Paulist Press, 1978), 342–343. This beautiful expression of insight, of profound friendship, comes at the very end of Julian’s Showings.